Prepare for an action packed India travel skiing tour. Stay at cozy ski lodges in Gulag for downhill skiing, with miles of ski trails. When you are not on your ski trails, stay at a deluxe houseboat on the beautiful lake, equipped with all modern facilities and heated with wood-burning and gas heaters. Cruise aboard romantic Shiokara and experience the enchanting Mogul gardens. Ski the Himalayas in Gulag, world's highest slopes. You can also enjoy other winter sports of your choice, skiing, snowmobiling, ice hockey, or snow-boarding. This bears no comparison to Colorado ski resorts. Himalayan skiing is a very unique winter sports experience at one of the best ski resorts. You will conclude this trip with a breath taking experience at the Taj Mahal. This will be your most memorable ski vacation. Day I NEW YORK/DELHI: Welcome aboard your flight to Delhi, enjoy onboard hospitality. This evening arrive in Delhi, where you'll be received and escorted to Hotel Park/ Hotel Claridges. Day 3 DELHI: After breakfast you'll visit the Presidential Palace, Parliament House, India Gate, Qutab Minar Tower, Jantar Mantar, and the fashionable Connaught Circus. Red Fort, Chandni Chowk, Mahalaxmi Temple and Mahatma Gandhi Samadhi. 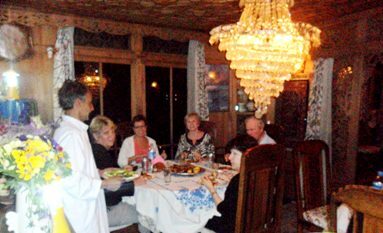 Fly to Srinagar upon arrival you will be escorted to deluxe houseboat. Enjoy the cosy ambience and acclimatize to 5,600 ft. altitude in the valley. Afternoon at leisure. Enjoy the Himalayan panoramas from your houseboat. Today travel by car to Gulmarg, world class resort at 9,500ft.and flanked by Nanga-Parbat, a 24,500ft.peak. Gulmarg's natural slopes turn into the premier skiing resort. Among the multitudes of slopes, there are a few which are serviced by ski lifts and gondolas. Most of the skiing becomes centered on these slopes, with ski runs ranging from 500 yards to 4 miles. Skiing equipment is provided. Stay at hotel Hilltop/ Royal Park are minutes from ski lifts and gondolas. Enjoy 3 days of skiing and other winter sports of your choice. After a leisurely breakfast, you have plenty of time to go skiing or snow mobiling. 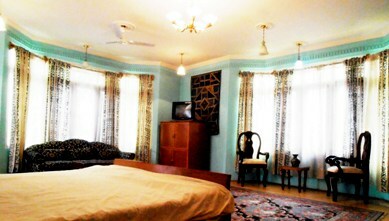 After lunch we will drive back to Srinagar and Return to your cozy houseboat for overnight stay. Cruise through Dal and Nagin Lakes float through a network of canals to the enchanted Mogul gardens of Nishat and Shalimar built in the 16th C. by Moghul emperors. 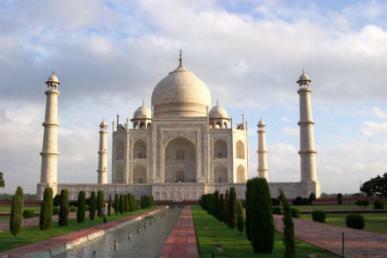 This morning fly to Delhi and drive directly to Agra, home city of the famous Taj Mahal. Hotel Taj View/ Clark's Shiraz.